There is one thing that is guaranteed to take me back to the feeling of being a tantrumming two year old. Sewing. Or more generally any kind of arts and crafts. 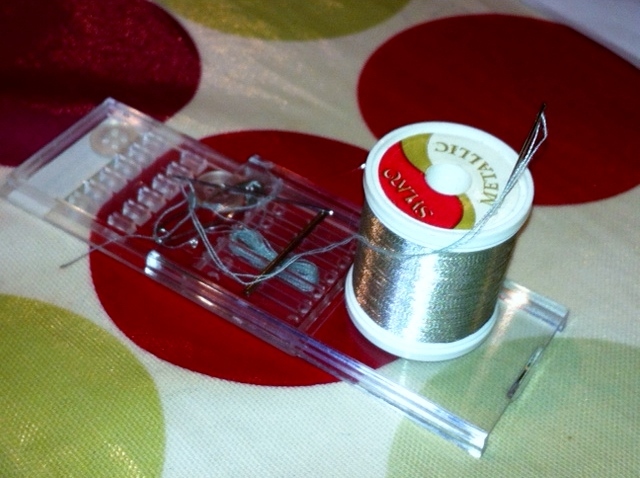 The tools of sewing – sight of which always makes me wish I had some Valium. My genes do not support the D- level of my abilities in this area. My mother could always conjure up an elaborate homemade costume for school at the last minute. Can-can dancer complete with crepe paper ruffles, matching hat and actual cans? Check. Bat made with bin liner wings incorporating bamboo skeleton? Check. She has knitted an actual farm complete with animals, thrown together a hobby horse in under an hour and fashioned a zombie bride costume at my daughter’s request. As for my sisters? One has an MA that reflects her talent in this area and the other a business, one element of which involves handmade toys. Meanwhile I can barely sew on a button. Sewing badges on to cub uniform brings me out in a cold sweat. My eldest son comes home to tell me I have sewed them on in the wrong place. I do that thing little children do – head on hands, face on the table. ‘I am not doing it again!’ I wail. Like me he is a perfectionist and looks mortified at the thought of going to his beloved cubs with his badges incorrectly located on his sweatshirt. He knows however, that in this case, when I say I’m not doing it again, I mean it. At school, I would regularly pass my basket weaving (oh yes, we had to) to my more talented friends to finish. As the end of the lesson neared and I was still struggling with crooked stitches, gaping edges and stuffing spilling out, the offending item would be swiftly removed and completed in five minutes so that I didn’t end up in trouble. Wood and metalwork seemed easier but mainly because the teachers took pity on me and did most of my projects themselves. I have tried though, I have tried. Last year I went with a group of friends to one of those cafés where you sit and make things and chat while you do it. While all of us wondered what we were doing when we were sitting there decoupaging a pottery flip flop, the level of stress I felt when being made to thread beads onto a wire heart and fix it to a piece of card was unparalleled. The whispering of one of the staff members in my ear of ‘don’t give up’ was the last straw. I suddenly realised I DON’T HAVE TO DO THIS. So I didn’t. To the amusement of my companions, I sat there, hands in my lap, face set in grim determination and resolved never ever to go back. I know that sewing is on the person specification for motherhood and is even apparently still up there on the list of desirable requirements for wife-hood. I have always struggled with the fact that I don’t meet 100% of the criteria for either job. Sometimes though your expectations of yourself are too high. You get better at letting yourself down gently as you get older. So I’m letting myself off this and focusing on the fact that my fairy cakes taste just fine.